The story you are about to read is mostly true. Only the names have been changed to protect the guilty. I wasn’t looking forward to the trip. Two is company and three is a crowd so the odds were stacked against already. But business is business and I can endure anything for a couple of days. It started wrong. I’d waited like I was supposed to, so we could go to the airport. I took a quick bathroom break and Monica was gone. She hadn’t waited. Phoebe was already there and had sent a text saying so. But the routine is for travelers in the building to catch a ride to the airport. Together. It was an omen of what was to come that I didn’t even recognize. Thankfully the airline had open seating. Because my boarding pass was a little further down the line than the other two there was no chance I’d have to sit with either of them. Farther along in the trip I’d realize I’d meant I didn’t have to sit with any of them because one of the travelers brought company. The first leg went well. Or maybe the gin and tonic made it seem that way. There was just time for a quick coffee before the next plane. But Monica needed food; chips and dip at the airport restaurant. I went along, sipping my coffee but worried about the time. Monica wasn’t concerned. Finally, desperate, I said I’m going. Monica laughed but settled the check and we all walked out. Spotting the sign above the line I said, girls, they are on the ‘B’ group. They started to run because they had ‘A’ boarding passes. I laughed, but it really wasn’t funny. Phoebe and I waited for luggage while Monica went to check out the rental car. I grabbed the suitcases and we met at the escalator. It was while waiting for the clerk to bring the car that I first saw. Monica had something on her shoulder. A cartoon picture popped into my head. It was a mad little character with a devil on one shoulder and an angel on the other. 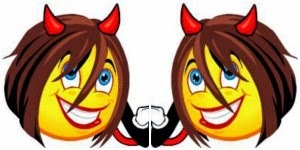 I looked at Monica and saw the same thing except there was a devil on both sides. Monica held out the keys and one of the devils climbed down and started shaking them. 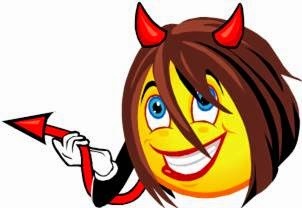 Devil 2 started shouting how people accused Monica of being aggressive and she wasn’t aggressive or pushy so someone else better drive. Phoebe and I stared, dumbfounded, and finally Phoebe took the keys. The devil went back to her shoulder. The trip to the hotel was actually pleasant. We talked. We made dinner plans. 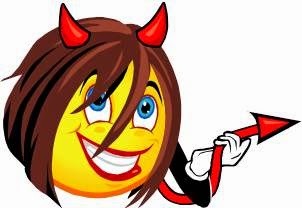 We checked in and suddenly one of the devils climbed down and said I’m going to my room. What time tomorrow? Another coworker was meeting us so I told them I’d text when he got here. Phoebe and I were headed towards the restaurant when Chandler arrived. We waited while he parked and he walked over with us. After dinner we set out for our rooms. My phone was on silent and I had missed three texts. There was one from Devil 1, one from Monica and another from Devil 2, all demanding a time for meeting in the morning. Already tired of this, I texted back and the arrangements were made. Early the next day the six of us squeezed into the rental and headed towards the meeting. Customarily, though not required, the group sits together. Monica and her two personalities went to a table with other people present. They sat down while we sat at the table behind. She turned and said she couldn’t have her back to the speaker so she had to sit at another table. D1 and D2 giggled and waved. I had plans for dinner since the five of them were going to be together. Nobody objected so I went ahead. The next morning we were gathering in the lobby for the last day of the seminar. Monica was already there with her two personalities. I checked out and sat down beside her. D1 came off her shoulder to tell me how they had to walk to a restaurant and eat alone. I was shocked. The others left you? Oh, no. We didn’t want to go with them. Well, I thought, that makes the situation a little different. I didn’t say it but they didn’t have to eat alone. They chose to. That day we all sat together like we were supposed to. The speaker presented and sometime that afternoon Phoebe got a message from the airline that our plane would be delayed by about three hours. She shared the information with the rest of us and Monica panicked. She and the Ds were afraid we might get stuck and not make it back home. So we left abruptly. Chandler went to his car and Monica was driving us to the airport. I sat in the backseat and was along for the ride at that time. I was fully prepared to wait at the airport because most of the time I have delays anyway. But D1 and D2 had other ideas. They decided we’d drive home. By that time neither Phoebe nor I cared. We did, however, want to call to make sure everything would be acceptable since we were traveling for business. Monica and her Ds refused. It’s fine they said. We asked about calling the rental agency to tell them we were keeping the car. No need said the Ds. We asked about calling our boss. Again we were told no. That decision was vetoed and Phoebe made the call. After some negotiation it was decided we could drive the six hours home. Immediately Monica and her Ds stated they were NOT driving all the way. Fine. Let’s just get this over with I thought. I was settled in the back seat when we stopped for gas. After arguing with Monica, she locked the car and we went inside. She handed Phoebe the keys so she thought, because of the prior comment, that Monica was finished driving and got in the driver’s seat when she went outside. I was paying and glanced out the window. I watched as the Ds began moving all of my belongings from the back to the front seat. I didn’t like it. When I went to the car I told them so. Dammit Monica, why did you do that? They teared up. In a shaky, quiet voice she said I don’t think anyone I work with has ever cussed at me. (Really? Maybe not so loud that she heard but I know it’s happened.) The Ds gave me the stink eye. I didn’t apologize and got in the front seat. They pouted. The whole way home Monica would say something, and if either Phoebe or I disagreed she’d send one of those devils down. The shaky voice would come back, the crocodile tears would appear and the pouting would commence. That would last a while then she’d return to her obnoxious self, the Ds would go back on her shoulders and the cycle would begin again. It was a tiring ride with lots of pauses in the conversation. Phoebe and I survived but neither of us wants to travel with a group like that for a long, long time! If I'm crazy then it's true. I found the lunatic. Right there in the car. You know, people shouldn’t try my patience when I have two long pointed sticks in my hands. Thank goodness for my yarn and needles. 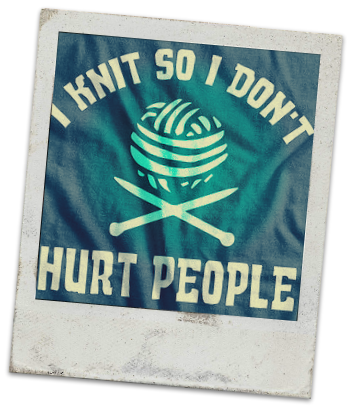 I was knitting so I wouldn’t hurt somebody. Now I need the t-shirt! You may be wrong for all I know. WHAT?!?! Is this real life?!? I couldn't even make up something that bad! ha ha Bring Joey on!! !